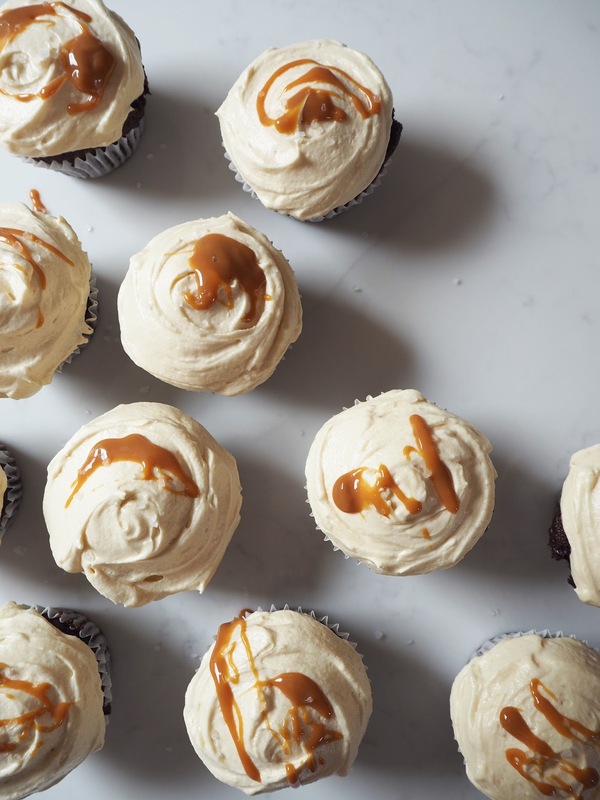 Salted caramel...it's sweet, it's salty, it's simply divine. Over the last year or two I have perfected my homemade salted caramel...as such I use it a lot. It has become a bit of signature flavour in the Bakes By Butter kitchen. 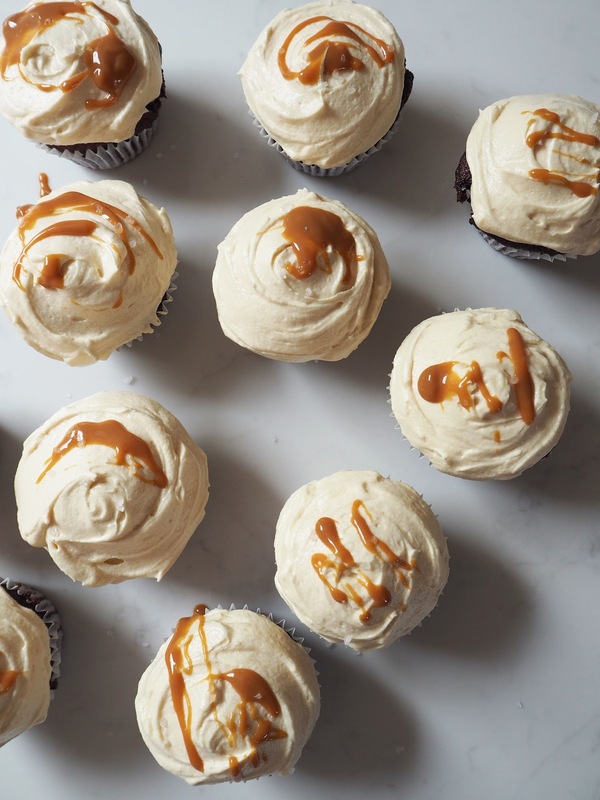 These salted caramel cupcakes are a particular favourite; I guarantee you'll not find a single person who doesn't like them. Preheat the oven to 170C and line a 12 hole muffin tin with cupcake cases. To make the sponge put the butter, sugar, flour, baking powder and cocoa powder in a large mixing bowl with a pinch of salt. Gently mix until they come together to form a crumb like mixture. In a jug lightly beat the milk and eggs together. With the mixer on slow pour half the liquid into the crumb mixture and mix thoroughly until combined. Pour in the rest of the liquid and beat on a high speed until combined and smooth with no lumps. The mixture will be quite runny. Spoon the final mixture into the cupcake cases 2/3 full. These will rise considerably. Place in the oven and bake for 20-25 minutes until they feel springy to touch or a skewer inserted comes out clean. Meanwhile, to make the salted caramel; place the sugar in a saucepan over a medium heat. Continually stir with a wooden spoon, the sugar will clump together and eventually turn into a thick amber coloured liquid. Once the sugar has melted add the butter and continue to stir until the butter has melted. Allow the mixture to boil for 1 minute then remove from the heat and add the salt. Leave to cool completely. To make the icing; beat the butter until light and fluffy. Add half the icing sugar and beat on a low speed, gradually increasing until combined. Add the rest of the icing sugar and repeat. Once the butter and icing sugar is combined, add the salted caramel and mix on a medium speed. Add the milk to slacken the mixture if necessary. Once combined beat on a high speed for 3-5 minutes until the buttercream is light and fluffy. 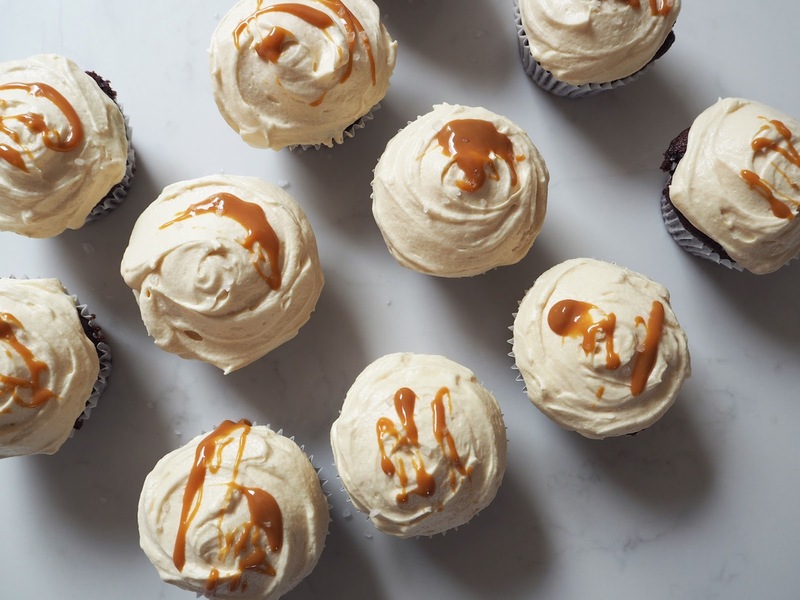 Ice the now cooled cupcakes, drizzle with a little salted caramel and a sprinkling of salt. *Keep any left over salted caramel in a jar in the fridge for up to two weeks; use for further bakes, drizzled on ice cream or simply eaten with a spoon!